The Itelmen, sometimes known as Kamchadal, are an ethnic group who are the original inhabitants living on the Kamchatka Peninsula in Russia. The Itelmen language (ethnonym: Itelmen) is distantly related to Chukchi and Koryak, forming the Chukotko-Kamchatkan language family, but it is now virtually extinct, the vast majority of ethnic Itelmens being native speakers of Russian. A. P. Volodin has published a grammar of the Itelmen language. The Itelmen had a substantial hunter-gatherer and fishing society with up to fifty thousand natives inhabiting the peninsula before they were decimated by the Cossack conquest in the 18th century. So much intermarriage took place between the natives and the Cossacks that Kamchadal now refers to the majority mixed population, and the term Itelmens at some point became reserved for persisting speakers of the Itelmen language. By 1993, there were less than 100 elderly speakers of the language left, but some 2,400 people considered themselves ethnic Itelmen in the 1989 census. By 2002, this number had risen to 3,180, and there are attempts at reviving the language. According to the 2010 census, there were 3,193 Itelmen in Russia. Ethnographic maps shows the Itlemens as residing primarily in the valley of the Kamchatka River in the middle of the peninsula. 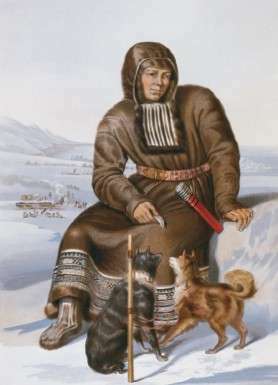 One of the few sources describing the Itelmen prior to total assimilation with the Russians is that of Georg Wilhelm Steller, who accompanied Vitus Bering on his Great Northern Expedition (Second Expedition to Kamchatka). Itelmen tended to settle along the various rivers of the Kamchatka Peninsula. At the time of the arrival of the first Cossacks to the peninsula, in the early 1650s, villages numbered between 200 and 300 residents, a number which had dwindled to 40 or 50 at most by the time of the composition of Steller’s account in 1744. Each village was centered around a single patriarchal household. Generally, young men seeking marriage joined the village of their wife. When a village became too large to sustain itself, it was divided and a portion of the villagers would create a settlement at another point along the same river. Steller describes a great variation of dialects from river to river, as the Itelmen predominantly communicated with communities which shared the river. Itelmen lived in different houses during the summer and winter seasons. The winter house, which was inhabited beginning in November, was dug into the soil 3–5 ft (0.91–1.52 m) in the shape of a rectangle. The walls were then covered with sticks and straw to prevent moisture from penetrating the interior. 4 beams at the center of the dwelling supported the roof of the house, upon which rafters were laid, connecting the top of the yurt to the earthen walls. Atop the wooden rafters, approximately a foot of straw was laid, on top of which the excavated dirt was placed and stamped down. An opening atop the yurt, off to one side of the four posts and supported by the two beams served as a smoke hole and an entrance. Opposite the fireplace, they made a passageway to the outside facing the river, which was left open only when fires were lit. 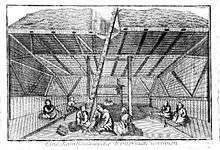 Different sleeping quarters were demarked by pieces of wood, on which straw mats and reindeer or seal skins were used to sleep. In the summer months, the Itelmen live in raised houses called pehm or pehmy. As the ground thaws in the summer, the floors of the winter houses began to flood. In the summer months, each family in the village lived in their own house, rather than sharing a large house as in winter. These raised homes or balagans as the Cossacks called them, were pyramids on raised platforms, with a door on the south and the north side. The extreme moisture of the climate required the raising of the homes for dry storage. Most villages, in addition to summer and winter houses, contained straw huts built on the ground, which were used for cooking dog food, boiling salt from sea water and rendering fat. Before the arrival of the Russians, villages were surrounded by an earthen wall or palisades after which this practice was banned. The Itelmen subscribed to a polytheistic religion. The creative god was referred to as Kutka or Kutga. Though he is regarded as the creator of all things, Steller describes a complete lack of veneration for him. The Itelmen attribute the problems and difficulties of life to his stupidity, and are quick to scold or curse him. They believed Kutka to be married to an intelligent woman named Chachy, who was said to have kept him from much foolishness and to have corrected him constantly. Kutka was believed to have lived on the greatest rivers of the Kamchatka Peninsula, and is said to have left a son and daughter for each river, which is used to explain the great variety of dialects present on the peninsula. The Itelmen also worshiped several spirits, Mitgh, who dwelled in the ocean and lived in the form of a fish. They believed in forest sprites, who were called ushakhtchu, said to resemble people. The mountain gods were called gamuli or little souls, who resided in the high mountains, especially volcanoes. The clouds were believed to be inhabited by the god billukai, who was responsible for thunder, lightning and storms. They postulated a devil, who was called kamma, who was said to live in a tree outside Nizhnoi village, which was annually shot up with arrows. Steller cites anecdotal evidence of several Russian forays into Kamchatka prior to the arrival of Vladimir Atlasov. Atlasov began his conquest of Kamchatka by sending Luka Morozko on reconnaissance foray in 1695, and embarked himself a year later with 120 men, half of which were Yukakghir auxiliaries, to gather tribute and to annex the region for the crown [Benson]. Leaving from Anadyrsk bay on the backs of reindeer, they explored much of the western coast, crossed the mountains to the east to subdue the population there. By mid July, 1696, he had reached the Kamchatka River, at which point he divided his party in two, one band returning westward and the other remaining on the eastern coast. At this point the Yukaghir auxiliaries rebelled, killing 6 Russians and wounding 6. A band of Koryaks additionally absconded with Atlasov’s itinerant reindeer herd, but were chased down by the Russians and killed to one man. The Itelmen he found there were in possession of a captive Japanese merchant’s clerk, who had been part of an expedition that wrecked and was overcome by Itelmen upon arrival at the Kamchatka River. Atlasov, who initially assumed the prisoner to be a Hindu from India, resulting in confusion over the word "Hondo" or Tokyo, had him sent to Moscow where Peter the Great had him establish a Japanese language school. "Kamchadal" is the name given to the original inhabitants of the Kamchatka Peninsula. Theirs was a substantial hunter-gatherer and fishing society with up to fifty thousand natives inhabiting the peninsula before they were decimated by the Cossacks in the 18th century. So much intermarriage took place between the natives and the Cossacks that 'Kamchadal' now refers to the majority mixed population and the term Itelmens is reserved for persisting speakers of the original Kamchadal language (about a thousand). The Kamchadal language (ethnonym: Itelmen) is distantly related to Chukchi and Koryak, and together they form the Chukotko-Kamchatkan language family. A. P. Volodin has published a grammar of the language. ↑ Map 3.7 (Kamchatka) from the series prepared for the INSROP (International Northern Sea Route Programme) Working Paper No. 90 in 1997.